Home » Blog » News » Clearlake Middle School. I.Q2 final, final revisions. 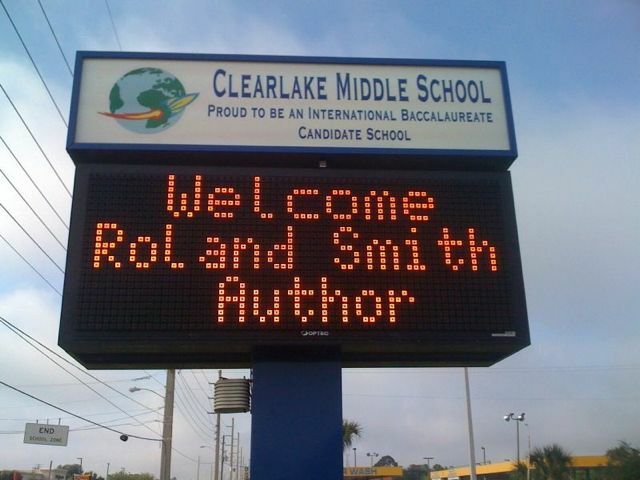 I’m back with my friends at Clearlake Middle School in Cocoa, Florida for my 4th time in the past ten years. Hitched a ride from Melbourne with principal Mark Mullins. It’s a great school with very cool 7th and 8th graders. I got the chance to speak to all of them today. We’re gettting close, but of course you want to know: WHEN IS IQ2 COMING OUT? Answer: I don’t know the exact date, but it will be soon. This June…I think. As soon as it’s out I will post it here, on my Face Book Fan Page, Twitter, etc. You will be the first to know. Thanks for visiting my school today!! I was in the last group! I enjoyed the Ethan stories and I like your sense of humor!! I am one of the students at Clearlake Middle School, also I am a 7th grader, I cant believe that you actually visited our school out of all the schools out there. I thought your visit was an excellent one, you made lots of good jokes but lots of explanatory subjects.I don’t mean to be rude but I didn’t really pay attention to your books but now my next goal is going to be to read all of your books. Thanks for taking the time to talk to our students. I was especially grateful that you took the time to meet one of our most special kids, to look at his book, and to sign “Cryptid Hunters” for him. You provided him with an amazing memory. A million thanks for your kindness. I love visiting Clearlake. We were talking today and I think I’ve been to your school 5 times, not 4! I think that’s a record for me. Thanks again Roland for another successful visit at Clearlake and at the conference. You are always a crowd pleaser and I loved the Ethan stories too! Yes, it is at least 5 visits now…could even be more. Sure missed not being a Clearlake wtih you. But glad to see you at the SRC conference. Hi Toni, I’m sorry I missed you too! Hi Claudia, it was wonderful seeing you too. 5 times? Time flies doesn’t it? ← Stockton, CA. Day Two. THE BIG READ tour.